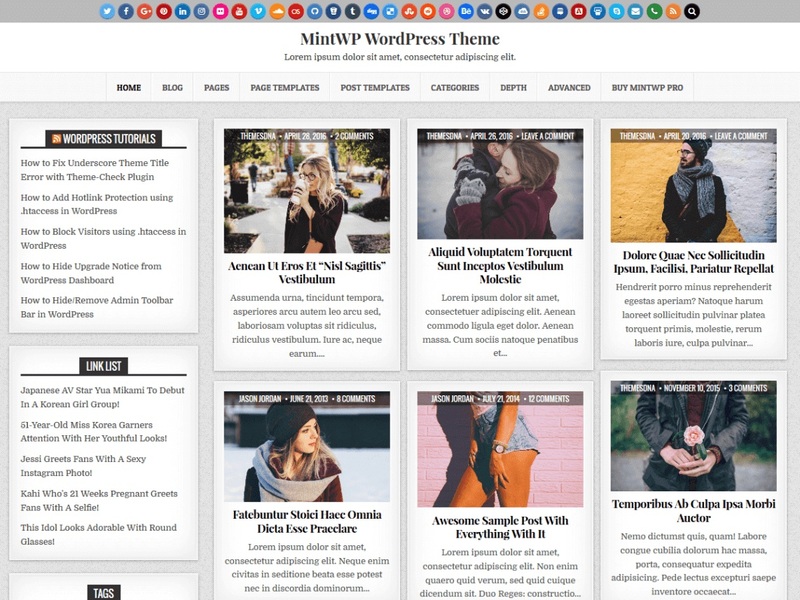 MintWP is clean and responsive, beautiful gallery theme for WordPress blogging websites. It has many Theme Customizer options to easily change things around and see live results, before applying them into the actual website. MintWP has a top navigation menu, grid style post summaries, full-width layout for posts/pages, sticky menu and sticky sidebar, 4 columns footer, header and footer social buttons, scroll-to-top button and more. With MintWP PRO version you can get color and font options, 2/3/4/5 columns grid-layouts for post grids, horizontal/square/vertical/auto-height thumbnail styles for post grids, featured posts widgets with grid-layout options and thumbnail style options, social buttons widget, about me widget, tabbed widget, different layout options for singular and non-singular pages, more custom page/post templates, 3 header layouts, share buttons, built-in contact form, related posts with thumbnails and more features.